BVA hosted a ribbon cutting ceremony to celebrate our $1.9M, 11,000 ft2 base expansion. 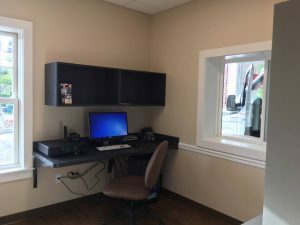 The extension connects to our original building, a Brighton historic landmark, and includes additional office/work space and a new 8-bay garage. 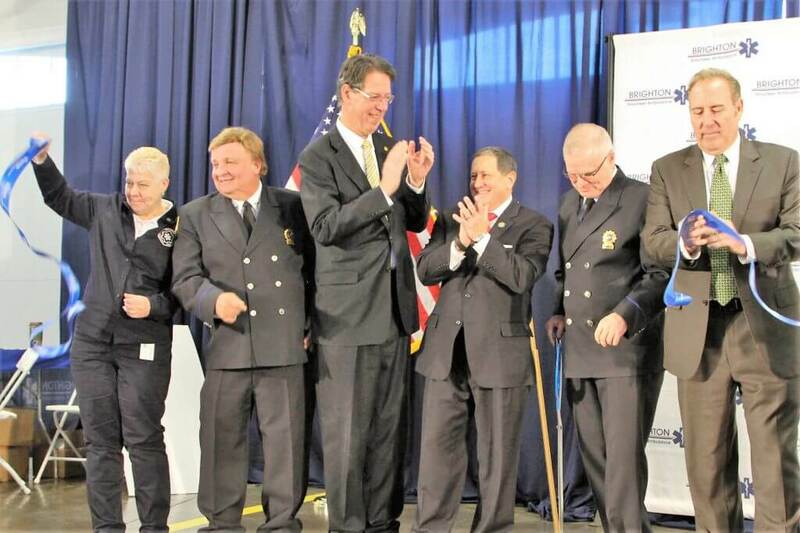 Helping us celebrate was US Congressman Joe Morelle; NYS Senator Joe Robach; NYS Assemblywoman-elect Jamie Romeo; Monroe County DA Sandra Doorley, Monroe County Clerk Adam Bello; Brighton Town Supervisor Bill Moehle; Brighton Police Chief Mark Henderson; Bob Duffy, Greater Rochester Chamber of Commerce; and representatives from the Brighton Fire Department, Rochester Fire Department, NYS Police, Monroe County Sheriff’s Office, OEC, and area EMS agencies. Michael Pollock, BVA Government Liaison, welcomed the attendees followed by BVA President Dan McCue who highlighted our 32-year history of proudly serving the town of Brighton. BVA VP & Expansion Project Manager Dennis Mietz explained that BVA fully paid for the expansion without the need of a Capital Campaign, or asking the Town for an increase in property taxes, or securing a mortgage. 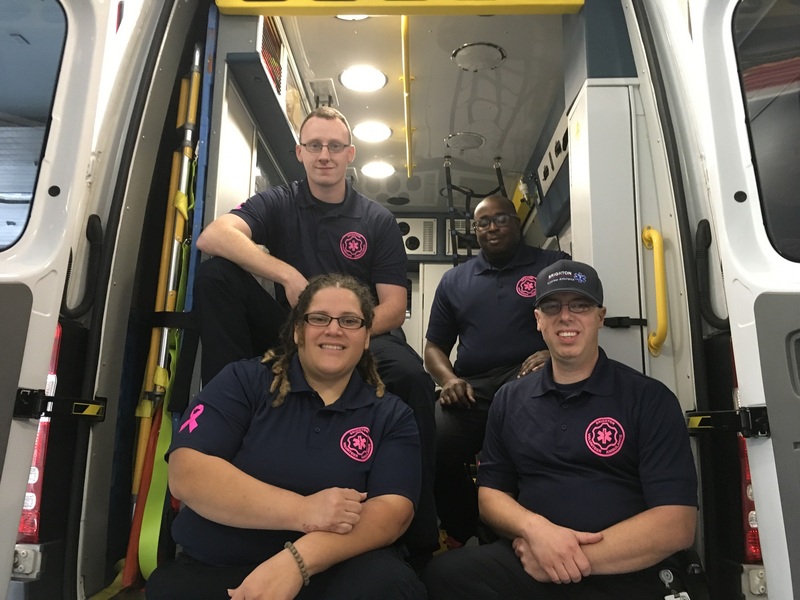 The expansion was funded by BVA dedicated capital funds, public donations, bequests, and (2) $250K NYS Grants secured by Senator Joe Robach and former Assemblyman Joe Morelle. For more information, read the media release or watch videos of the event on the BVA Facebook page. 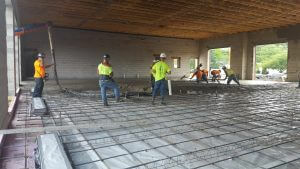 September 2018: Work in the new building is complete to the point that we can start moving in! 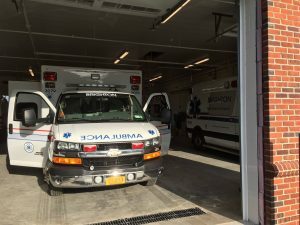 All emergency vehicles are now housed in the new 8-bay garage, and we’ve moved into the new Dispatch Office, kitchen, living room, business area & bedrooms. 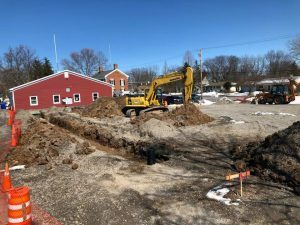 Work on the old garage & historical red brick building is underway. August 2018: The new garage, office area & kitchen is being finalized, the driveway is paved and curbing is in place. 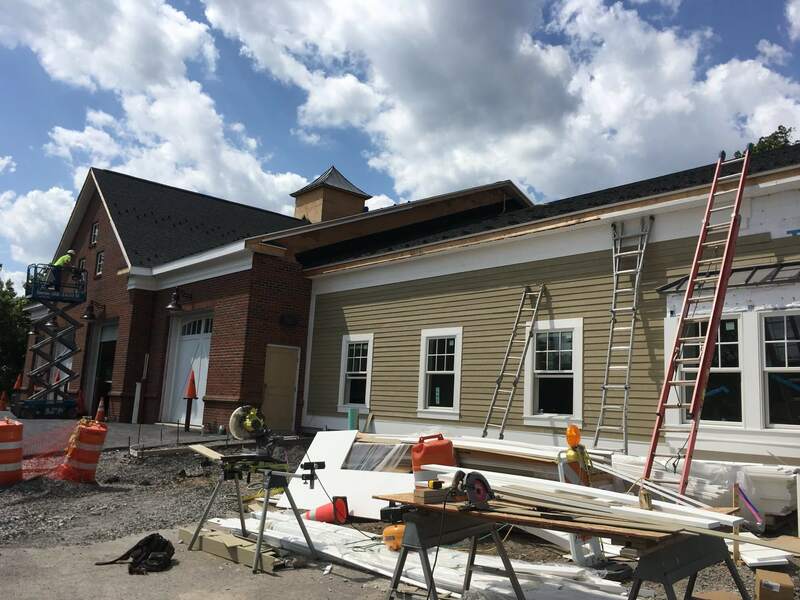 We plan to move our emergency vehicles, furnishings & office equipment into the new structure by Labor Day so renovation of the former garage & house into office space can begin. We hope to have the project completed by mid-November. 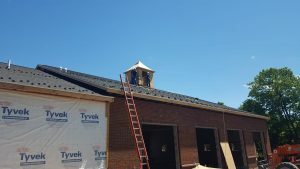 July 2018: Brick work is completed on the front & back of the new garage; garage floor is poured; cupola is attached to the roof. The new brick closely matches the original brick still on our main building. 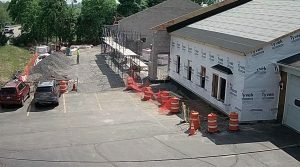 June 2018: Roof trusses are up and the new 8-bay garage is taking shape. 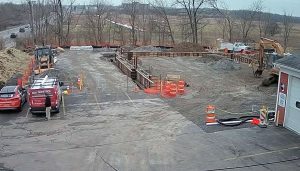 The area wrapped in Tyvek (next to the new garage) will house the Dispatch Center, offices, and crew areas offering quick access to the new garage. 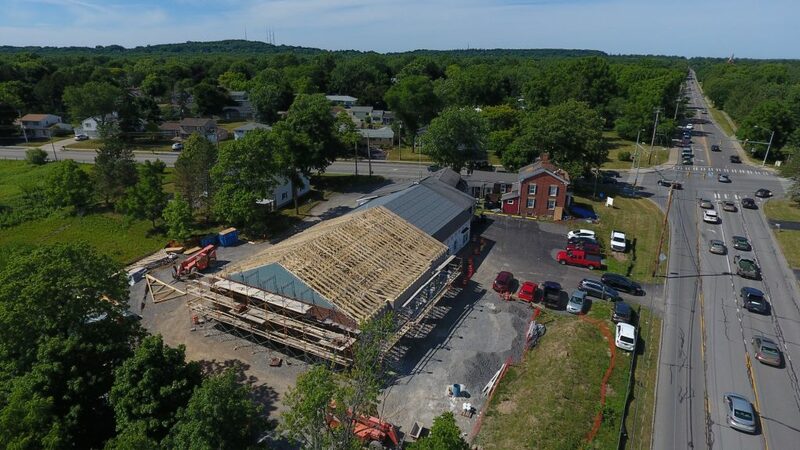 We are also replacing the roof on our existing red brick structure, an 1850 Brighton Historical Landmark. 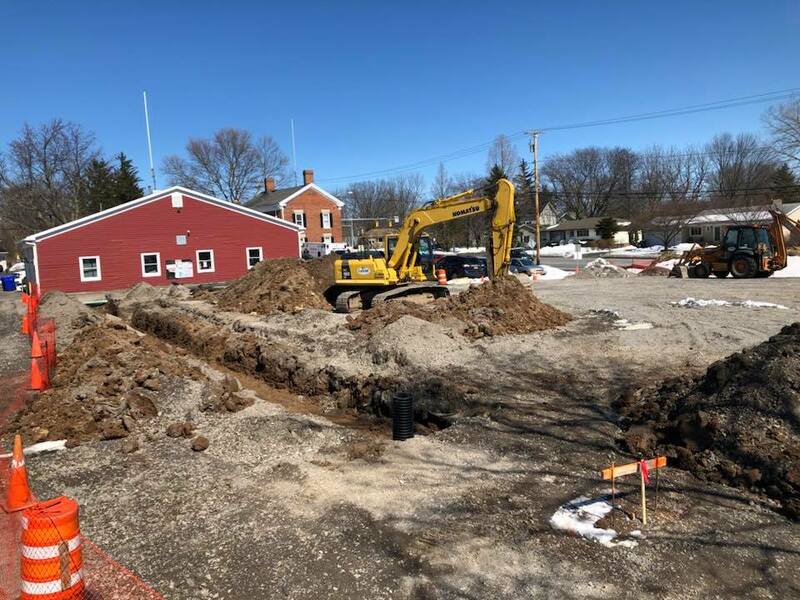 Spring 2018: It may not be pretty at this point, but we were very excited when excavation began in March. When the weather warmed in April, the concrete foundation for the expanded crew quarters was poured and walls started to go up. Pardon our mess as you drive by. Read about our Base Expansion Groundbreaking Ceremony.